I've considered doing individual colour guides/swatches for a while as well as doing guides for the human versions that appear in Equestria Girls, since I was asked to do a seperate colour guide for Sunset Shimmer I figured why not do it this way? 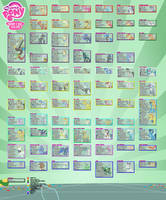 If you like this you may also like my huge MLP Colour Guide which currently contains about 65 Swatches. What's the name of her skin color? This is nice, but you made the body stroke the same color as the body fill for her pony self. yeah, I noticed that recently when I was using this myself. I may get around to fixing that at some point. Question for ya! How can we be sure what Sunset's exact colors are as a pony, since we only saw her in that form at night in poor lighting? Thats true, and the simple answer is that you cant be sure, in fact I'm not sure, but I looked at a bunch of pictures of her both in the movie at night and also a bunch of fan made image in daylight that to me looked right, as well as knowing what her "human" colours are I basically just tried to match it up as close as possible. I'm certainly not a professional at this, and I'm sure there are better more technical ways of working out the right colours but I believe this is pretty damn close considering, and it certainly wouldn't look wrong to use these colours. Glad to hear it, I'll try and get more of these done for other characters soon.